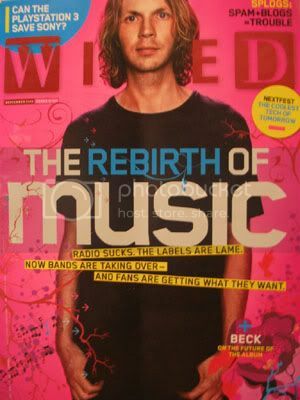 The newest issue of Wired showed up in my mailbox a few days back, in all its hot-pink covered glory. As can be surmised by the photo posted above, the cover story is a series of pieces documenting the music industry's so-called "rebirth". This includes a short interview with remix-generation posterboy Beck in which he essenitally extols personalization, and plugs his new album. It seems that in today's digital world, an artist such as Beck is not satisfied with merely releasing a standard record to his fans. He wants to make available as many videos, remixes, and ProTools tracks as possible. While I'm just as much a fan of personalization as the next person, I can't help but think that this buisness model will end up re-selling fans the same basic product in slightly different forms. The most interesting of the articles touches on the rise of indie music-purveyors Pitchfork. While I've always taken the site with a grain of salt, especially the at times extremely pretentious reviews, Pitchfork's story is one of pure DIY-ingenuity. Without a doubt, the site has come to fill a void in a time where honest coverage of the music world is hard to come by. However, this is a double-edged sword in more than one respect, the most potent being the fact that many now take Pitchfork's word as gospel, which has done wonders for some bands but also contributed to the ruin of several artists. The piece also includes the argument that blogs (such as the one you are reading) are picking up much of the slack, and providing an equally as opinioned alternative to the big Fork. A great read, and within the covers of one of my favorite magazines no less. I'll post links once these two articles become available on the web.